Essentially unchanged from 85.3 percent in 2009. 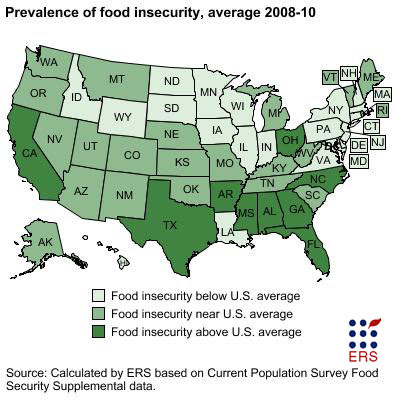 14.5 percent (17.2 million) of U.S. households were food insecure at some time during 2010. Essentially unchanged from 14.7 percent in 2009. 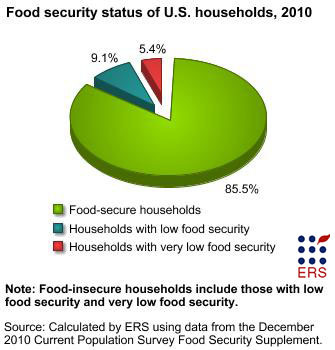 9.1 percent (10.9 million) of U.S. households had low food security in 2010. Essentially unchanged from 9.0 percent in 2009. 5.4 percent (6.4 million) of U.S. households had very low food security at some time during 2010. Down from 5.7 percent in 2009. The defining characteristic of very low food security is that, at times during the year, the food intake of household members is reduced and their normal eating patterns are disrupted because the household lacks money and other resources for food. Very low food security can be characterized in terms of the conditions that households in this category typically report in the annual food security survey. In 2010, 48.8 million people lived in food-insecure households. 11.3 million adults lived in households with very low food security. 16.2 million children lived in food-insecure households in which children, along with adults, were food insecure . However, children are usually protected from substantial reductions in food intake even in households with very low food security. In 2010, 976,000 children (1.3 percent of the Nation’s children) lived in households with very low food security among children. Households with incomes below the Federal poverty line—$22,113 for a family of four in 2010—(40.2 percent). Overall, households with children had nearly twice the rate of food insecurity (20.2 percent) as those without children (11.7 percent). Among households with children, married-couple families had the lowest rate of food insecurity (13.8 percent). The prevalence of food insecurity was higher for households located in principal cities of metropolitan areas (17.0 percent) than for those in nonmetro areas (14.7 percent) and in suburbs and other metropolitan areas outside principal cities (12.6 percent). Regionally, the food insecurity rate was higher in the South (16.0 percent) and West (15.1 percent) than in the Midwest (13.3 percent) and Northeast (12.4 percent). Married couples with children (3.6 percent). Multiple-adult households with no children (4.0 percent). Households with elderly people (2.6 percent). Families with children, headed by single women (10.8 percent). 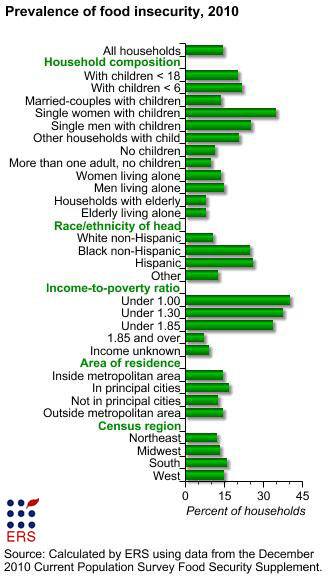 Households with incomes below the poverty line (16.5 percent). 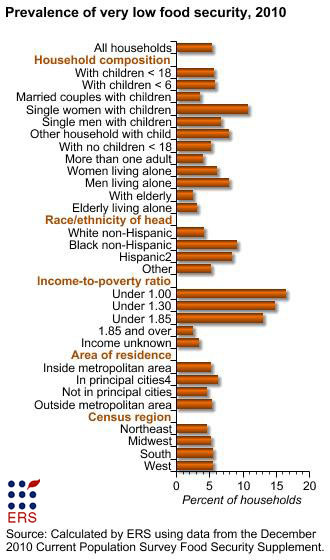 Households in principal cities of metropolitan areas (6.3 percent). 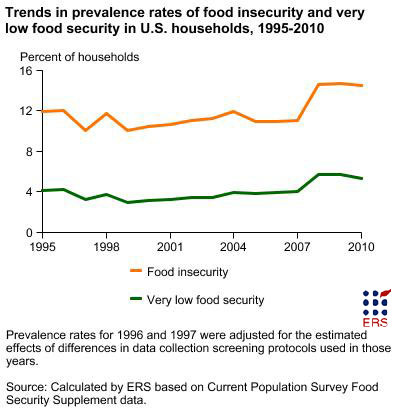 The prevalence of food insecurity declined from 11.9 percent of households in 2004 to 11.0 percent in 2005 and remained near that level until 2007. In 2008, the prevalence of food insecurity increased to 14.6 percent of households and was essentially unchanged at 14.7 percent in 2009 and 14.5 percent in 2010. The prevalence of very low food security remained essentially unchanged from 2004 (3.9 percent) to 2007 (4.1 percent), then increased to 5.7 percent in 2008, remained at 5.7 percent in 2009, and declined to 5.4 percent in 2010. The year-to-year deviations from a consistent downward trend between 1995 and 2000 include a substantial 2-year cycle that is believed to result from seasonal effects on food security prevalence rates. The CPS food security surveys over this period were conducted in April in odd-numbered years and August or September in even-numbered years. Measured prevalence of food insecurity was higher in the August/September collections, suggesting a seasonal-response effect. In 2001 and later years, the surveys were conducted in early December, which avoids seasonality effects in interpreting annual changes. 99 percent reported having worried that their food would run out before they got money to buy more. 96 percent reported that an adult had cut the size of meals or skipped meals because there was not enough money for food. 95 percent of respondents reported that they had eaten less than they felt they should because there was not enough money for food. 66 percent of respondents reported that they had been hungry but did not eat because they could not afford enough food. 45 percent of respondents reported having lost weight because they did not have enough money for food. 29 percent reported that an adult did not eat for a whole day because there was not enough money for food. 22 percent reported that this had occurred in 3 or more months. All households without children that were classified as having very low food security reported at least six of these conditions, and 65 percent reported seven or more. Food-insecure conditions in households with children followed a similar pattern.